We are pleased to announce that the full Maccabee Queen DVD is now available for sale for US $14.99 or NIS 50, plus shipping. To order the DVD, please send us an email by clicking here. Payment is by cash or Paypal. 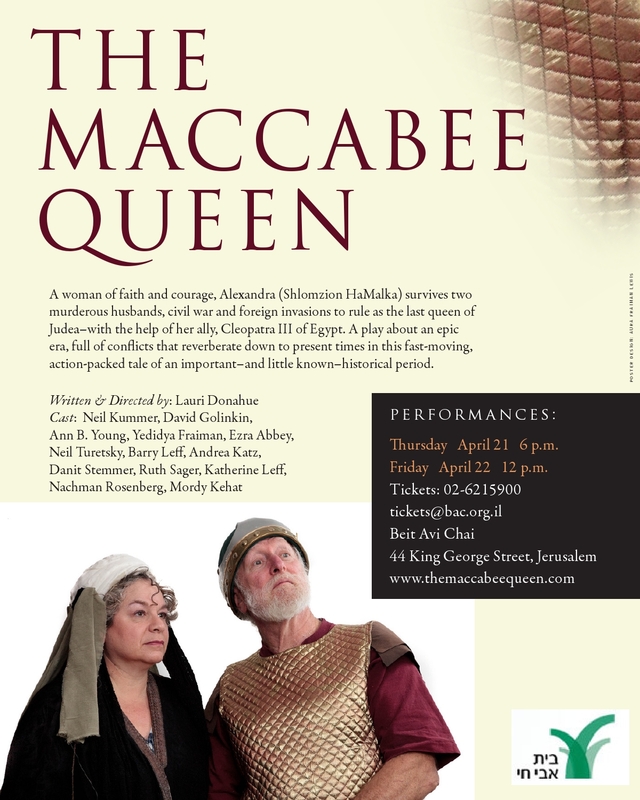 The YouTube clip here will show you the first 20 minutes of The Maccabee Queen. We are deep in rehearsals; they are going well. It’s fun, we’re working on acting, not just remembering our lines. Alexandra and Cleopatra are regal, Mattathias is angry, Alexander is drunk, we’re all having a good time. Had costume fittings today, we’re going to be the well-dressed elite of 2,100 years ago. Performances are April 20 and 21. Click here for information on ordering tickets. You can read a sample of The Maccabee Queen by clicking on “Sample” at the menu above. To order a copy of the full script, click on the link to Baker’s Plays in the “Performance Rights” box. Auditions will be held January 24 and 27 at “The Mercaz” in the German Colony, Jerusalem.